A shooting at the Marjory Stoneman Douglas high school took the lives of 17 pupils on Wednesday. In their grief, teenagers, their parents, teachers and the families of those who lost loved ones quickly organised calls for tighter gun reform. In a quest to keep the cause in the public consciousness for more than one news cycle, the students have banded together with other organisations to arrange marches, protests and meetings with lawmakers in an attempt to change federal and state policy on gun control. Here are some of the ways they are getting their message heard. 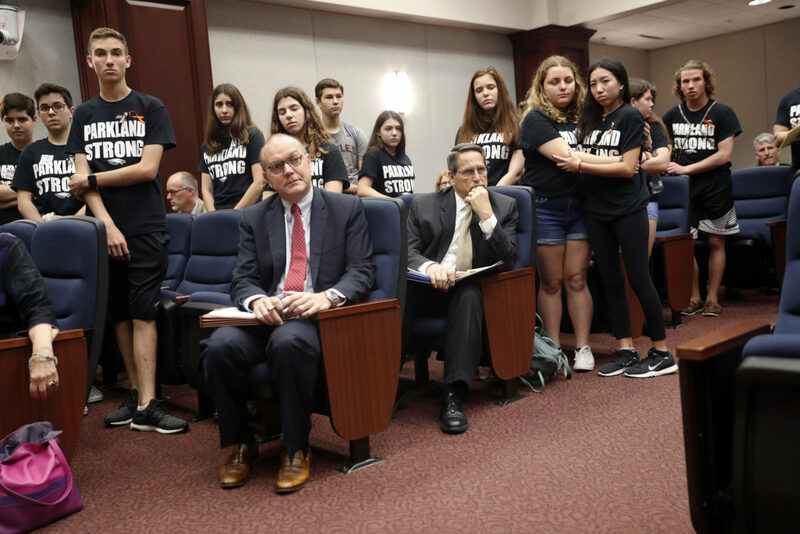 Survivors of the Florida school shooting descended on the state legislature to meet with lawmakers and push for tighter restrictions on gun ownership. About 100 pupils from the high school made the 400-mile trip from their school to the capitol building in Tallahassee on three buses, staying overnight on camp beds in the local civic centre. Democrats attempted to get a bill to ban assault rifles and large-capacity magazines heard on the House floor on Tuesday. Republicans, who dominate the chamber, dismissed it. Students who were at the Capitol ahead of their classmates found that Republicans steered the conversation away from gun restrictions. Students and thousands of supporters then gathered outside the state Capitol, chanting “enough is enough” and “this is what democracy looks like”. Activist group Teens For Gun Reform arranged for 17 teenagers to lie down in front of the White House on Monday, the same number killed in last week’s shooting. They were joined by more students chanting and giving speeches in a protest which has lasted in different forms until Wednesday. Led by survivors of last week’s shooting, the march for our lives will feature a main march in Washington, supported by many smaller marches in cities across the US, including Seattle, Philadelphia and Houston. It will take place on March 24. Organisers of the march wrote on their event website: “March For Our Lives is created by, inspired by, and led by students across the country who will no longer risk their lives waiting for someone else to take action to stop the epidemic of mass school shootings that has become all too familiar. Celebrities have also got behind the cause. George and Amal Clooney donated $500,000 to the movement, which was soon matched by Oprah Winfrey. April 20 will see the 19th anniversary of the Columbine school shooting in Colorado, which killed 15 people. To mark the anniversary and bolster the current protest movement, 15-year-old Lane Murdock from Ridgefield, Connecticut set up National School Walkout. Her campaign asks students to leave their desks at 10am on Tuesday and proceed to an outdoor area on campus. They are then to hold a 17-minute silence in tribute to the 17 people killed last week at Marjory Stoneman Douglas High School, followed by speeches from anyone who wishes to address the gathering. The Women’s March youth movement has also arranged a walkout on March 14 following a similar model. Students particularly impacted by last week’s atrocity have already taken to the streets. Pupils from schools surrounding Marjory Stoneman Douglas walked out of school brandishing signs and chanting for gun reform, and many gathered outside Boca Raton city hall in Florida.